NFKB p65 antibody LS-C18906 is an unconjugated rabbit polyclonal antibody to NFKB p65 (RELA). Validated for ELISA and WB. NFkB p65 (Rel A) peptide corresponding to a region near phospho Serine 276 of the human protein conjugated to Keyhole Limpet Hemocyanin (KLH). Sequence information: QLRRPpSDRELSC. 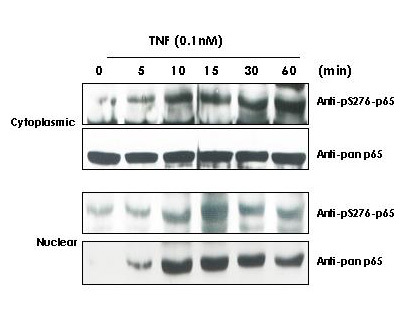 This phospho specific polyclonal antibody reacts human pS276 p65 and shows minimal reactivity by western blot with non-phosphorylated p65 and minimal reactivity by ELISA against the non-phosphorylated form of the immunizing peptide. A 65 kD band corresponding to human p65 is detected. HeLa cells or TNF inducible KBM-5 cells can be used as a positive control. Western Blot - Anti-NFKB p65 (Rel A) pS276 Antibody. TNF Induces phosphorylation of p65 in KBM-5 cells. Western Blot - Anti-NFKB p65 (Rel A) pS276 Antibody. TNF Induces phosphorylation of p65 in KBM-5 cells. Cytoplasmic and nuclear protein lysates prepared after 0, 5, 10, 15, 30 and 60 minutes of 0.1 nM TNF treatment of KBM-5 cells shows inducible phosphorylation using phospho specific polyclonal anti-human pS276 p65. pan reactive anti-p65 (code# LS-B653) was used a control to show the presence of total p65 in both the cytoplasmic and nuclear extracts. Phosphorylation of p65 occurs after approximately 10 min of TNF exposure. Migration of phosphorylated p65 into the nucleus occurs within a similar time frame. HRP conjugated Gt-anti-Rabbit IgG was used to develop the blot using a chemiluminescent detection method. Other detection methods will yield similar results. Personal Communication, Aggarwal BB. Western Blot - Anti-NFKB p65 (Rel A) pS276 Antibody. Anti-pS276 shows phospho p65 staining in carcinoma cells. Western blot of total protein lysates from various human head and neck tumors shows phospho p65 staining in tumor cell lines using phospho specific polyclonal anti-human pS276 p65. Lanes 1-6 contain protein lysates from human squamous carcinoma cell lines. Lane 7 is a protein lysate from a primary culture of human keratinocytes and does not show significant levels of phosphorylated p65. Lane 8 contains protein lysate from ATCC SCC9 cells (also a head and neck squamous carcinoma). Lane 9 contains lysate from EGF-induced human derived A431 cells. Lane 10 (not shown) contains a molecular weight standard. Concurrent staining with anti-beta microtubulin (not shown) was used to confirm equal protein loading in all lanes. HRP conjugated Gt-anti-Rabbit IgG was used to develop the blot using a chemiluminescent detection method. Other detection methods will yield similar results. Data contributed by Yu, M., NIH, personal communication. Western Blot - Anti-NFKB p65 (Rel A) pS276 Antibody. Anti-pS529 shows phospho p65 staining in carcinoma cells.